Shopping for Finding Nemo / Finding Dory Games? 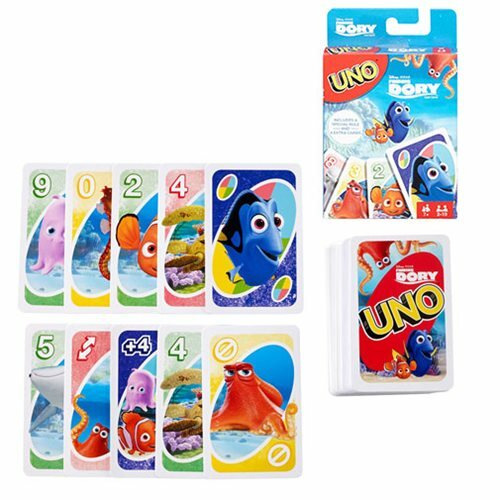 Its the UNO you love, but this version of the beloved game features iconic characters from Disney Pixar's Finding Dory movie! Players race to get rid of all their cards by matching a card in their hand with the current card shown on top of the deck. Special Dory rule cards and 2x customizable cards deliver game-changing moments and help defeat opponents! Score points by being the first to get rid of all the cards in your hand. First player or team to 500 wins. When you're down to one card, don't forget to yell UNO! Contains 112 cards plus instructions. For 2 to 10 players, ages 7 and older.